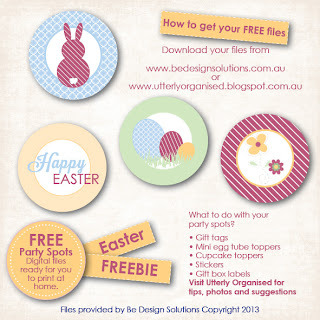 Here it is.... as promised here is your freebie Easter printable thanks to Be Design Solutions. 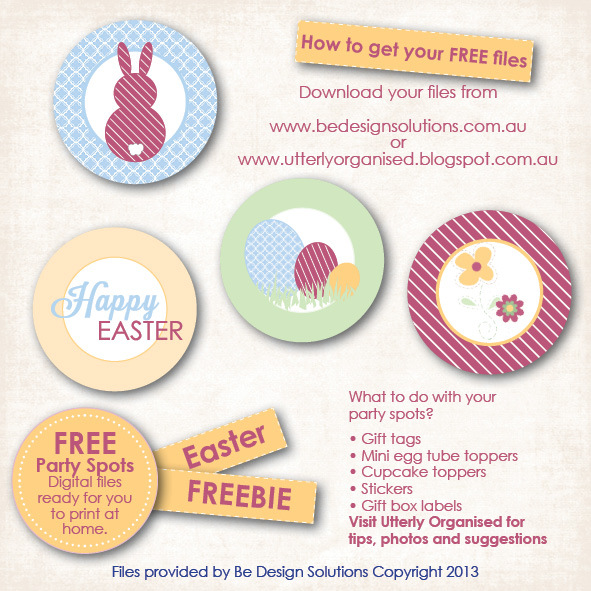 Available to download and print off to your little hearts content, are the super cute Party Spots that have oh so many uses! And anything else you please!! The file is available to download here through Media Fire. During the week I will be sharing some photos of what I am doing with these - I had better get my Easter craft on with less than 2 weeks to go!! As always, we'd love for you to share photographs of what you have done with your printables. Photographs or details can be emailed to utterlyorganised@gmail.com or posted to my Facebook Page. We really hope that you enjoy these and once again thank you Be Design Solutions!! !